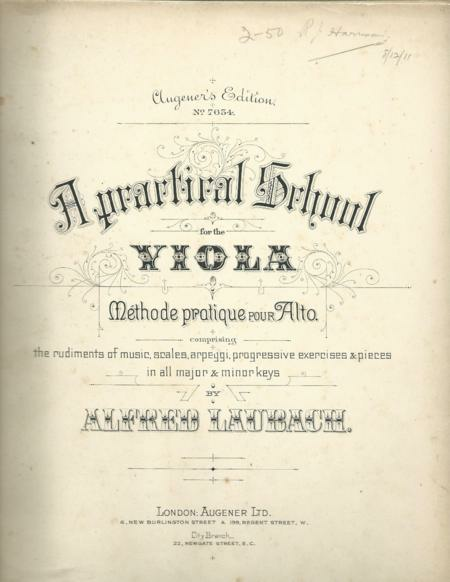 Alfred Laubach's A Practical School for the Viola (published in 1878) filled an acute need for instruction on the viola itself. Alfred Laubach came from a large family of musicians and had his own music studio in London. His method book contains 80 pages of well-chosen exercises and pleasing pieces. These latter consist in the earlier stages mostly of folk-songs, and afterwards of excerpts from classical works. The Method Book opens with some rudimentary explanations dealing with the notation (stave, time-value of notes, chromatic signs, bars, repeats, etc.). Next follow preliminary exercises on the open strings, and then on fingered notes. The various kinds of bowing are gradually introduced. Attention is paid to technique: shifting, double-stopping, arpeggios, harmonics, pizzicato.A short follows here. No. 116, the E minor scale in the 1st and 2nd positions; No. 117, Exercises for staccato bowing; No. 118, a Prelude; No. 110, an Exercise by Rolla; No. 120, the A major scale in the 1st and 3rd positions; No. 121, a flowing Allegro; No. 122, a short movement with dotted notes; No. 123, an Exercise on the shake; No. 124, an Andante cantabile by Schubert; No. 125, an Allegro by Rolla; No. 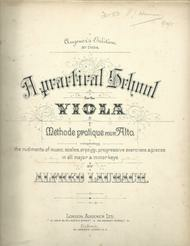 126, an Allegretto by Campagnoli; No. 127, the F sharp minor scale in the 1st, 2nd, 3rd, and 4th positions; No. 128, an Exercise by Rolla; No, 129, and E major scale in the 1st and 2nd positions; No. 130, an Andante con Expressione; and No. 131, Minuet from a Divertimento by Mozart. This very rare, well-used copy is complete in content. Everything is preserved the way it was originally conceived. It is a wonderful publication of the past for students seeking to refine their technique and musicianship, plus for the collector of old and rare books. This is a truly an historical and cultural treasure which illuminates a very special time in our history. .